Since my previous bento was a big failure, I needed to make something I’m more comfortable with. And nothing makes me feel better than this guy. There’s a very popular picture of Totoro, where Totoro, chu-Totoro, chibi-Totoro, Satsuki and Mei are fishing while sitting on a big branch over a stream. 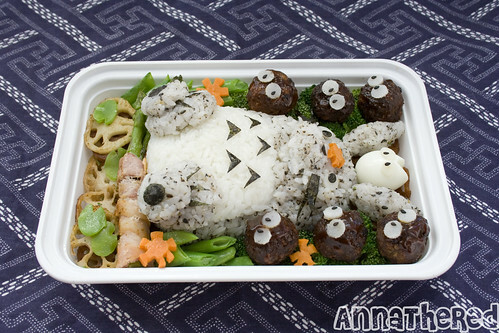 I really like it (and I’m sure my boyfriend does since it’s Totoro! ), and wanted to create the scene. Since I don’t make people for my kyaraben, I was going to make the three Totoro. But when I was drawing the sketch, I realized that I couldn’t fit chu-Totoro in the bento… So I decided to make only Totoro and chibi-Totoro as usual. First I sauteed sliced renkon (lotus root), and laid it on the bottom of the bento box. 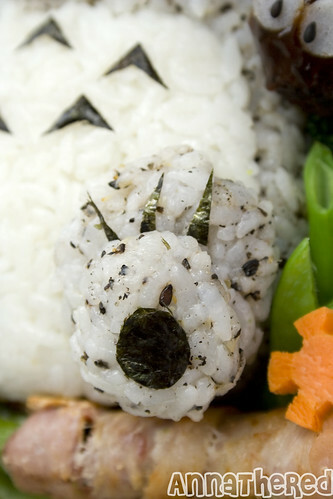 I mixed rice with black sesame seed with salt and molded it into the shape of Totoro using plastic wrap, and I placed it on the renkon. 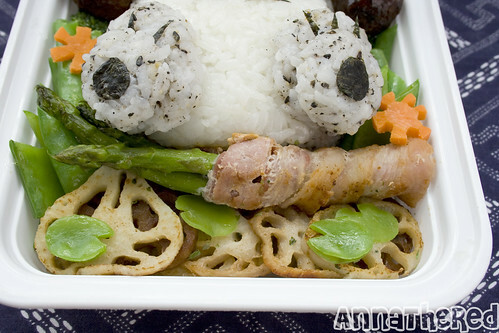 I also made the ears and feet with the same rice, to put them on later. 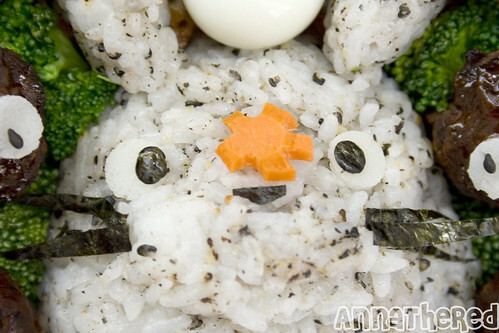 (see “how to make Totoro with rice”) Then I boiled broccoli, seasoned with salt and put it around Totoro. 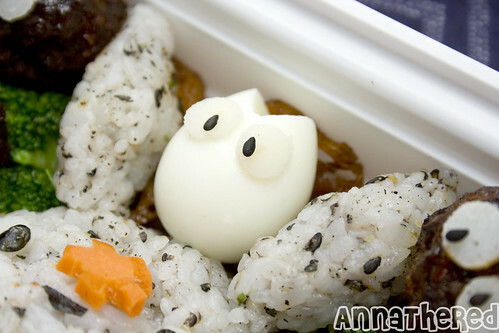 Then I made chibi-Totoro body with a quail egg (see “how to make mini-Totoro with eggs”), and put it on Totoro’s head. The night before I had made hamburg (see “how to make Japanese style hamburg”), and I also made a lot of meatballs to freeze for bento and dinner. So I used the meatballs and put the hamburg sauce for the Makkurokurosuke, and put them on the broccoli. For the branch I wrapped asparagus with bacon, cooked it, and put it under Totoro’s body so it’d look like he was sitting on the branch. I made water lily leaves with snowpeas, and background grass with string beans. After all the characters were made, I made a bunch of eyes by slicing and cutting out kamaboko (fishcake) using a small plastic bottle cap. 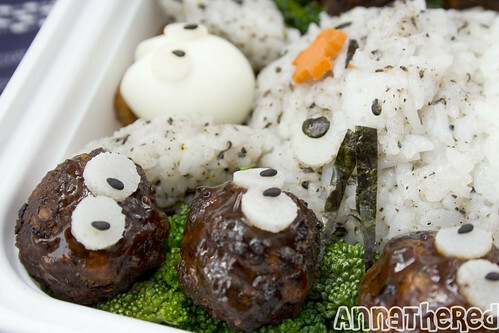 For chibi-Totoro and makkurokurosuke’s pupils I put black sesame seeds, and seaweed for Totoro’s. For his nose, whiskers, nails for his feet, and whiskers I cut out seaweed. At this point, I realized that it looked nothing like the drawing I did… In the actual Totoro picture, chibi-Totoro has a fishing pole and he’s got a flower on the hook, but I didn’t have anything I could make a fishing pole with, so I decided to forget about it and put in carrot flowers I had frozen previously (see “How to freeze carrot flowers”). 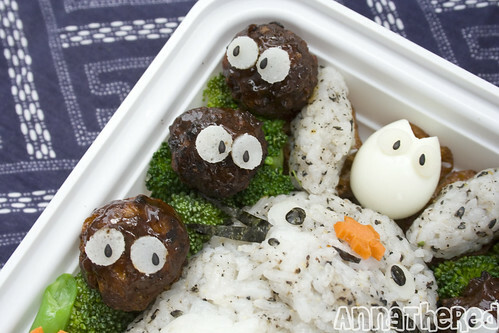 Your bentos are awesome – I like the Ghibli ones the best. I’ve posted a few of your creations and a link back here on my blog, http://jijiintokyo.blogspot.com. Hope this is ok! Hi Anna! 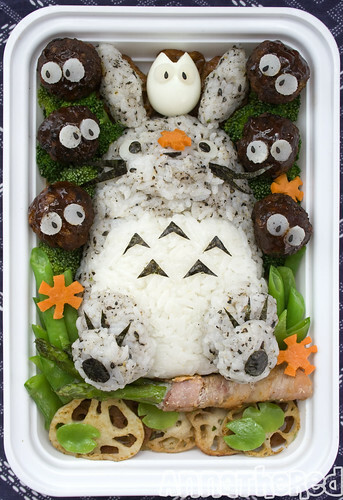 I love totoro and this is absolutely AMAZING! I wouldn’t have the heart to eat it… If my boyfriend made this for me, I’d marry him in a second!